If you’re a fan of Baileys Irish Cream as I am, you’ll love this fun twist on tiramisu from one of my all-time favorite cookbooks, Nigella Express by Nigella Lawson. 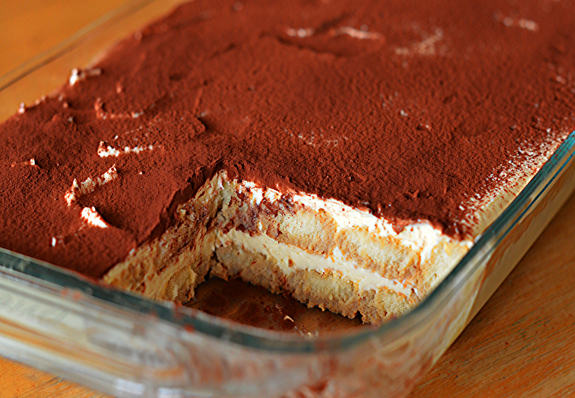 The first time I made it, my husband proclaimed it the best tiramisu he’d ever had. Since then, it’s become a dinner party regular at our house. With layers of espresso-soaked lady fingers and light mascarpone cream, it looks and tastes impressive yet is almost ridiculously easy to make. You spend 20 minutes putting it together, if that, then just pop it in the fridge overnight. In a separate bowl, whisk the egg white until soft peaks form when you lift the whisk out of the bowl. Mix the cooled espresso with ¾ cup of the Baileys in a shallow bowl. Set aside. Separate the eggs, but keep only one of the whites. In a medium bowl, whisk the egg yolks and sugar together until the mixture is thick, pale yellow, and forms a ribbon when the whisk is lifted out of the bowl, about a minute. Add the remaining ¼ cup Baileys and mascarpone and whisk until the mixture is smooth.